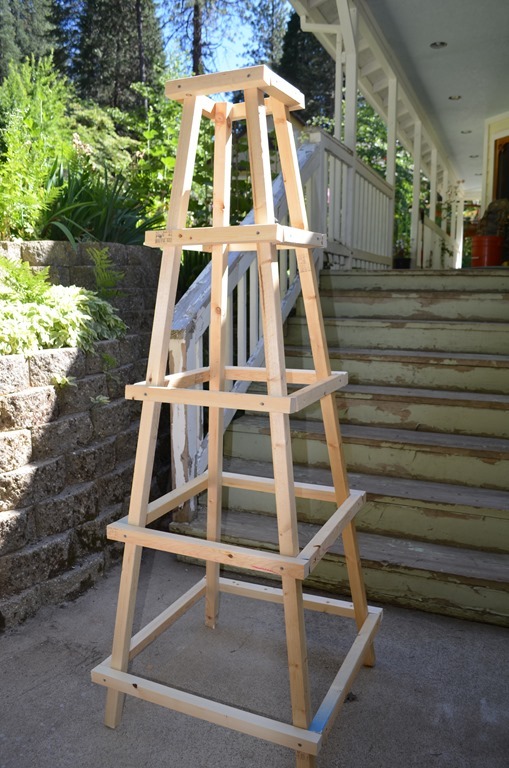 Easy Garden Obelisk – a great and inexpensive DIY! This obelisk can be used for roses, sweet peas or even squash in the garden. 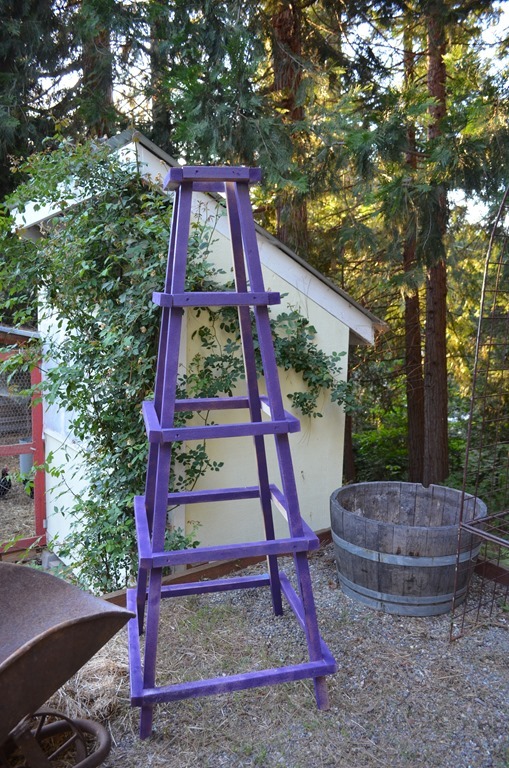 There is so many things you can use this easy garden obelisk for. I have even made an arbor from them for my Secret Garden. Last year I even used it as a tomato cage, it worked great! Plus it was so much prettier than my wire support cages. Why do I call it easy??? Because unlike all the obelisk plans I found online this one has no angle cuts. Since it is going in the garden and I plan on it being covered with something that climbs I did not care if edges matched up precisely or were perfectly mitered. Want to see how we built it? The photos are not the best but I had to take them in less than optimum light. Now that you have your pieces cut you are going to build a ladder. 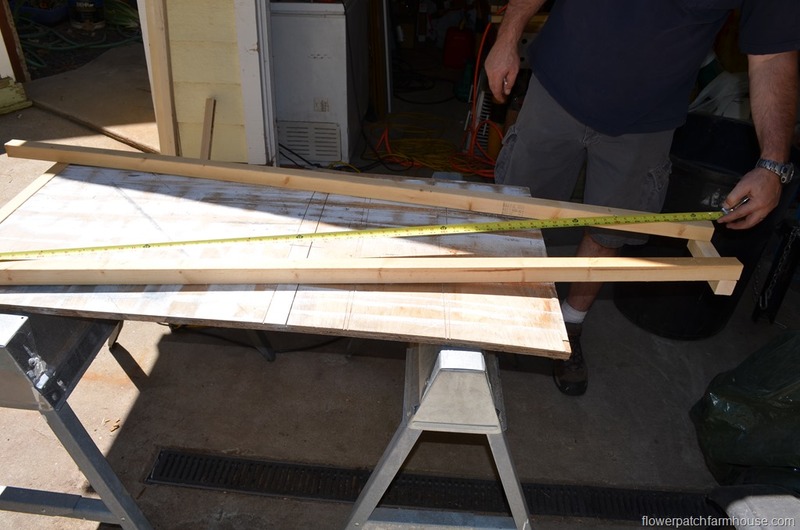 Lay 2 of the 72 inch pieces on a flat table. We used the edge of the table as a straight edge. 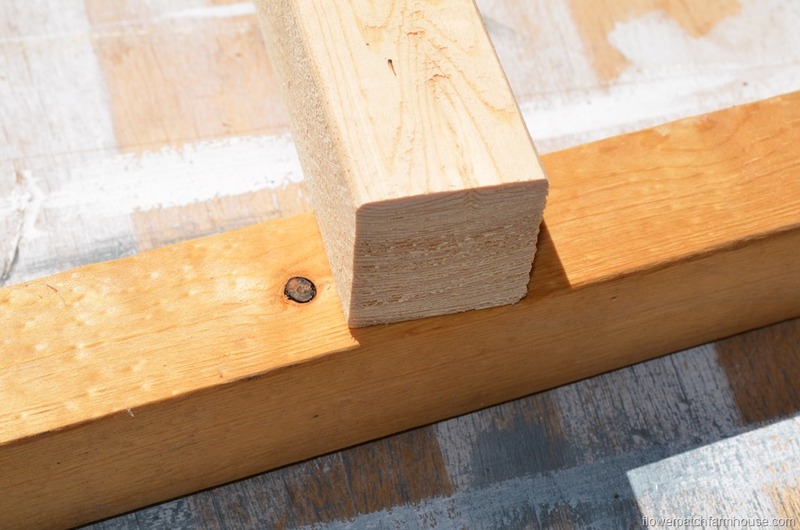 Measure up 6 inches from the bottom of both legs for placement of the bottom rung or crosspiece. Fasten the rung to the legs. 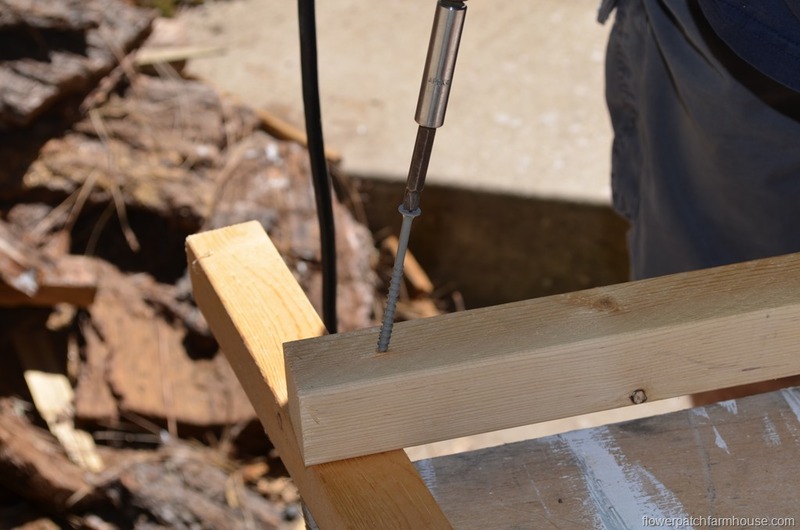 (24 inch piece) I would recommend pre-drilling but my husband cheats. When I make the next one I will pre-drill. Since the legs are at an angle and the cross pieces are cut square we only line up the top corner to the edge of the leg. The gap you can see will be covered later. We start with the lowest rung then attach the top rung. (8 inch piece) Same deal, again match up the top corner. Here is a better photo of lining up the rungs to the leg edges. 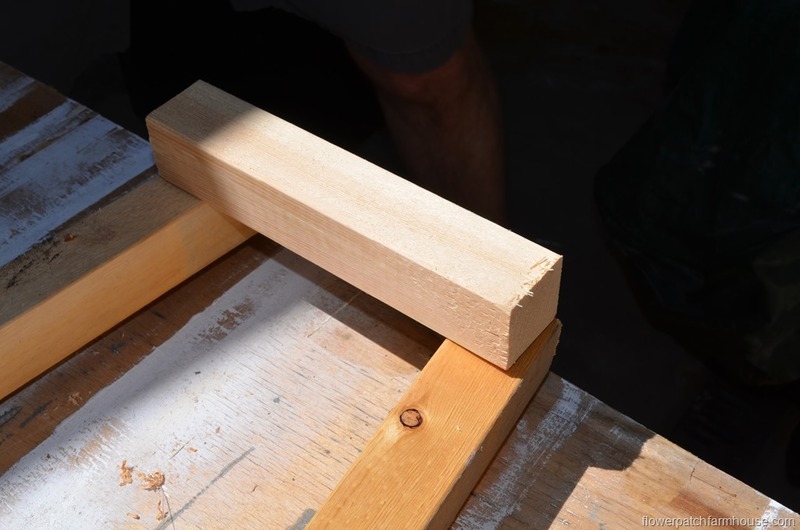 Check for square, you do that by taking measurements on the diagonal and adjusting the legs until the measurements match as closely as possible. The adjusting is called racking, you push on the corner that has the longer dimension (if they don’t match) by half the distance. 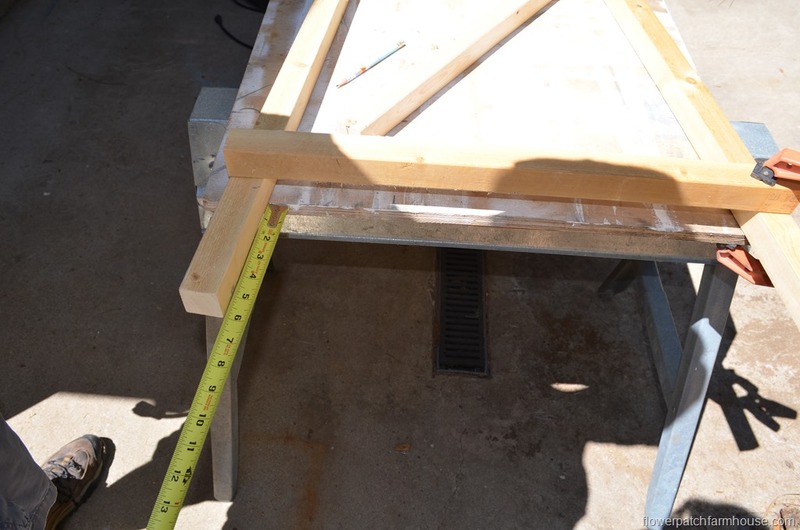 example: If one side is 1/2 inch longer push the corner a 1/4 inch then re-measure (it is not an exact science but it will bring it closer to square) Keep racking until dimensions are equal or very close. Now attach your other cross pieces or rungs. We measured from the bottom of the bottom rung and the top of the top rung (hook your measuring tape on the bottom rung and pull it to the top of the top rung and read) We divided that measurement by 4 to get our placements for the rungs. Ours were 16 1/4 inches apart. We marked the spots for each rung. 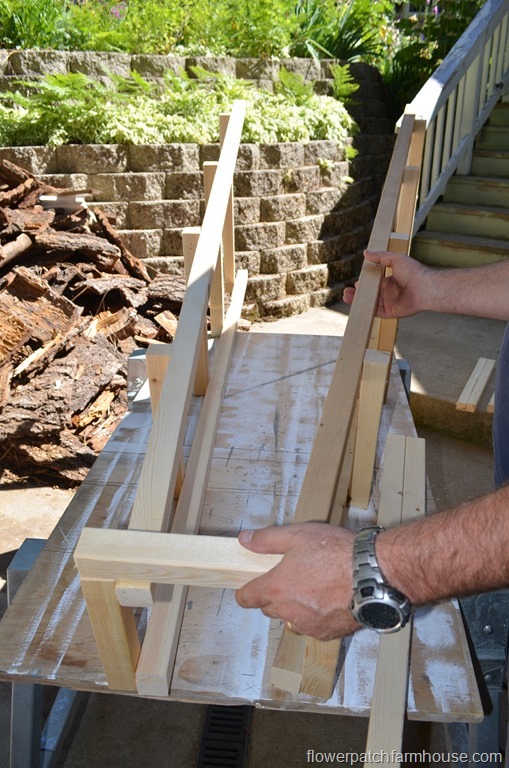 Now you should have your first ladder built. The really sweet part of this is the next ladder will be a piece of cake. Use the first one as a template. No measuring or figuring this time. 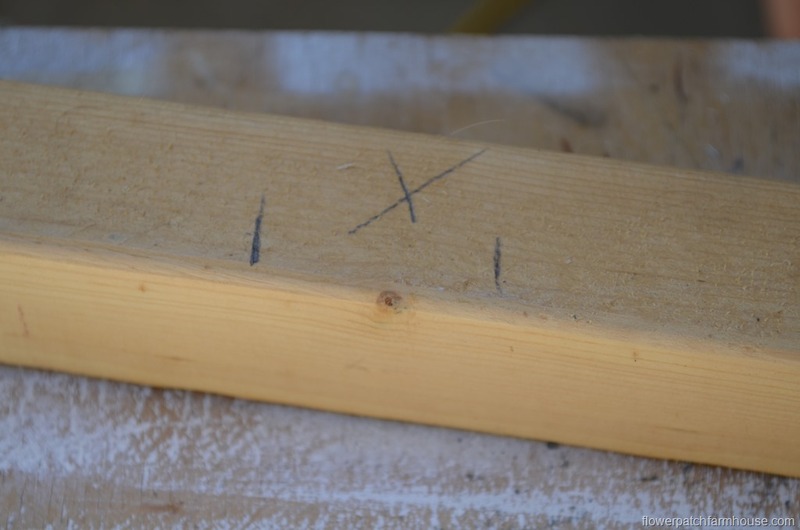 Lay your 2 x 2’s right on the ladder you just built. 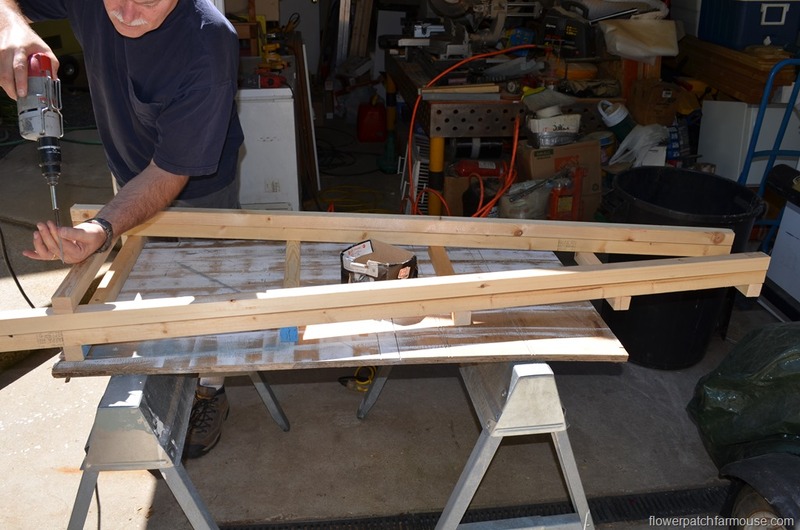 Just whip along matching board for board and your second ladder will be complete in no time. 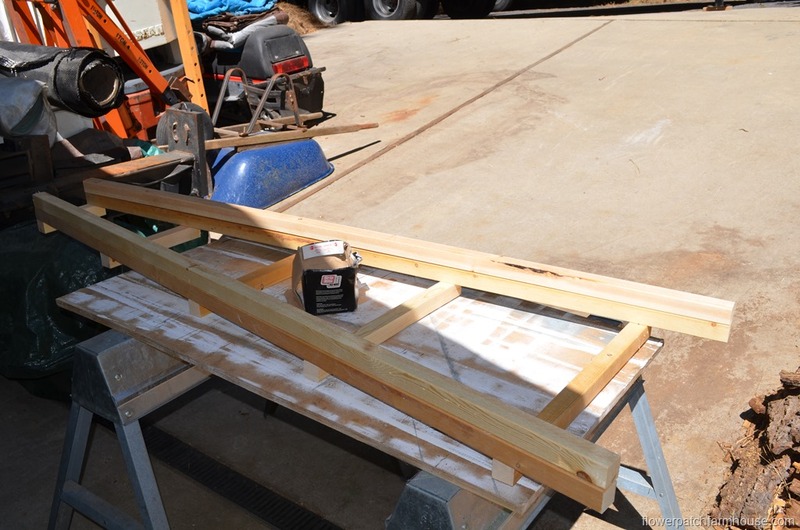 Now lay your ladders on their sides to attach the side rungs. This set of rungs are 3 inches longer than the ladder rungs, they will overlap the first set as you see in the photo. You can attach a top plate with a fancy topper but I did not have one. I have considered cutting out a silhouette of a flying pig and attaching it. Maybe make it a weather vane but that is for another day. Now paint it whatever color you wish. I would recommend painting or using a protective oil (tung oil) on this since is it just pine. If it was redwood or cedar you could just let it weather. Current price at our local lumberyard for 8 foot 2 x 2’s is $2.30 each. So the total for this project for the lumber was about $20. We had the 3 inch screws on hand and I drug out an old can of spray paint. Now I just need to build a couple more and I am set. 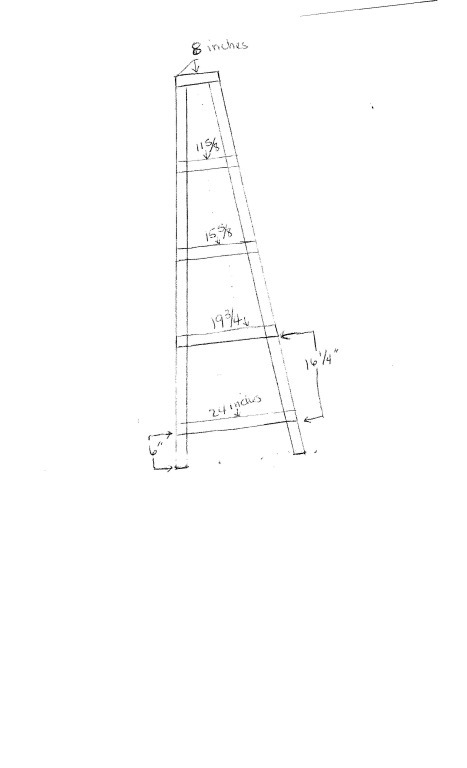 Here is a rough sketch of the first ladder if a visual will help you. It is all downhill after you get the first side built. I love DIY Obelisk, here is a quick video for one for containers. Arbor we built from obelisks! If you enjoyed this Please PIN and share! What a great project! It would look cute with a flying pig on it! I love flying pigs! Looks easy enough, and the cost is right. Thanks for sharing your building plan; I would paint mine purple too. Pamela, I love your obelisk! I use to have a couple of them years ago, but they finally bit the dust. Funny thing, I just asked my hubby today if he would make me some new ones. Thanks for sharing this great tutorial with SYC. I know it would last longer made of cedar or redwood but this is what I had on hand. If I keep it painted maybe it will last a few good seasons. By then I am usually ready to change things up anyways. Hi Pamela, just hopping back to say that I will be featuring you at SYC today. I am giving you a double feature. Also hi-lighting your Foxgloves post. I noticed (sure unintentional) that there is no link back to SYC on that post. Would love if you could add it. Thanks for posting this. I need one badly because I bought a rose last year and this year I found out it was a climber! I have ideas for a couple variations that I want to try. As soon as I get them done I will post them too. Thank you. I just typed out what my husband had written as far as dimensions without double checking his math. 🙂 Plus I noted that my formatting for the entire post had gone wonky but now I have fixed it. Fun! Love that purple color too! Wishing you a happy Spring! I am hoping for more rain this Spring as we are in drought conditions but it will be a happy one no matter what! I have decreed it. Love the color you painted this. I so want to create something tall like this for my garden this spring/summer. Thanks for inspiring me! Hello from the Mega Spring Linky! I love mine, both of them and I plan on making more this coming season. Please do share when you make yours. We purchased two similar obelisks last year at a nursery, they don’t have any this year. The ones we bought have long pointed feet so they stick into the ground and are perfect for raising tomatoes! 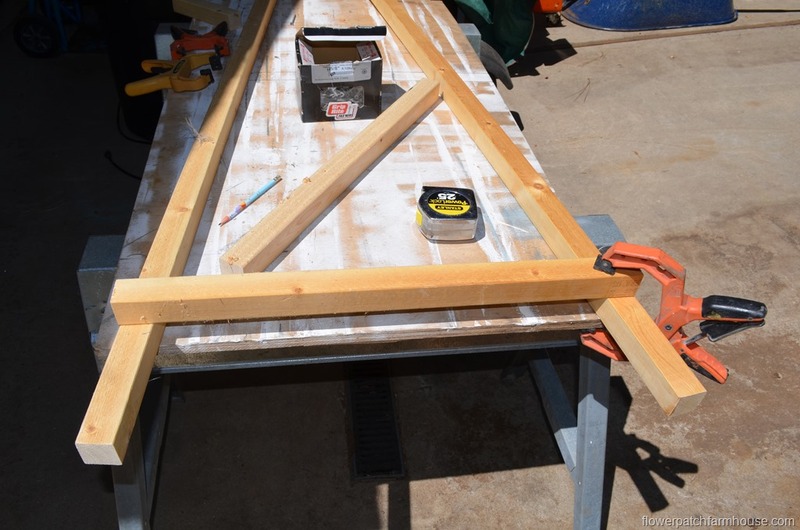 This year we plan to make some with long wood and paint sticks as cross pieces…..
LOVE LOVE LOVE! I too am so aggravated by all those angled cuts!This is EXACTLY what I’ve been searching for to build for my gardens THANK YOU! I WILL be making a bunch of these! Lovely colour and instructions look easy to follow, thanks for this, you’ve given me a great idea! I have another obelisk we did with an X pattern on the side instead of ladder like, check it out if you wish, I think I live it even better. I have wanted to make one of these for a long time. Thanks for the instructions! I am finding mine to be quite useful and very decorative in the garden. I am making a couple more in different sizes for some roses that need a bit of support. Finally!! Somebody has shown us a simple obelisk that we can all build. I’ve hesitated because of all the angle cuts. Pinning this one! I let mine sit out all winter to test its durability. It is still in great shape but I did need to glue it a bit again as the screws loosened slightly. I am working on one made out of rebar now. Saw the plans for this last week – thought it looked pretty simple. My husband bought the materials and we put it together this weekend. Added a large birdhouse to the top and it’s just adorable! Thanks so much for sharing these plans. What a great idea, I think adding a birdhouse is just the ticket. I know I have one around here somewhere. thank you! Thanks for sharing! This was chosen as a favorite on our From the Farm blog hop! This is one of my most popular posts of all time. I think many people like the ease of building it without having to fiddle with angle cuts. Thank you! I’m planning on building this to use as an outside Christmas tree. I need something to hang my Christmas lights on as most of my trees are too big or too far from my house. Then I can use it again in the summer! That is a great idea. And who says you can light it up only at Christmas, wouldn’t that just make a great garden element. I may try it myself to light the garden at night. We stumbled over here coming from a different web address annd thought I might as well check things out. Neat. Would look amazing in the garden and its my fav color. Great job. Well, I didn’t know what an obelisk was until reading this post! I have seen those…but never heard the name before! This is so much prettier than the ones I have seen! Thanks for sharing the directions! You are quite welcome, Jamie, and thank you. They do make a nice way to trellis a climbing rose or give height to your garden, also make it a fancy cucumber support. I have a few more designs up my sleeve I want to try this year. For an heirloom tomato like Brandywine one would be great in the center or plant one on either side to make it work for two. For cucumbers I planted one by each leg so it worked for 4. Right now I am making some shorter ones using 1 x 2 furring strips. I will share that soon as well. Love this!! Don’t be surprised if you see me copying this, I have always loved these but never wanted to pay top dollar for them. You two did a great job! We just finished building an arbor made from two of these. It is soooo wonderfully easy and inexpensive too compared to what is available to purchase. I can’t wait to share it. Pamela your garden obelisk caught my eye at The Scoop party. I need a few of these in my garden and appreciate the easy to follow tutorial your provided. Pinning this for inspiration – thank you! stayed tuned, I am coming back with an arbor made from these easy obelisks. It is so great and as easy to build on a budget! You are most welcome. 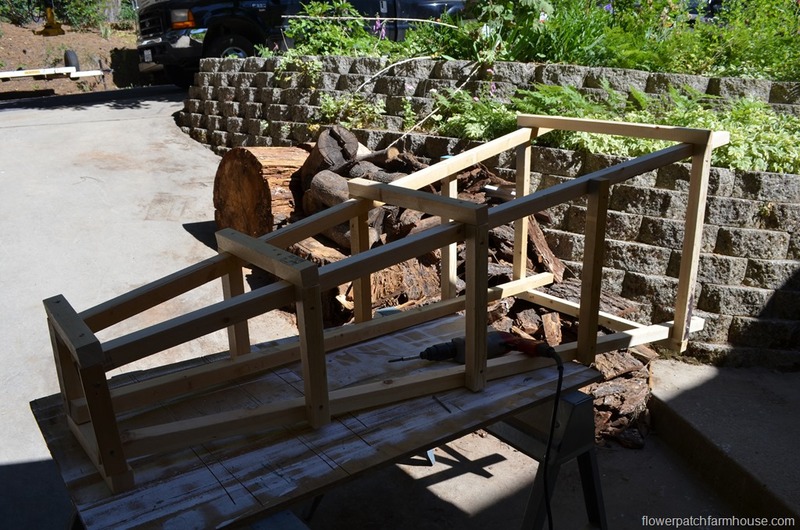 Thank you for step by step how to build one, this is very neat for my garden. I do love mine and how versatile they are in the garden. Prettier than regular tomato cages and very sturdy! Hello Pam. I can’t thank you enough for your tutorial. My husband just finished making the obelisk (I would very much like to post some pics but I don’t know how) and it looks absolutely beautiful. I’m in the seventh heaven right now. He used all your husband’s measurements and the whole project took him around two hours. We added a woden finial on top that we purchased at Home Depot, so it’s really pretty. Now it’s my job to stain it. I think I going for a dark brown to add some contrast to the climbing plants and to make the colour of the flowers pop. Thank you again! Have you ever built one to fit around the base of a tree? We plan to make one to add color and interest to the trunk of a very tall and boring palm tree! I plan to grow flowering vines on it . No, I haven’t. That sounds so interesting. I am sure it will be lovely once your vines fill out and bloom. Let me know how it goes for you.